Every year large amounts of plastic debris enter the ocean, where it slowly fragments and accumulates in convergence zones. Scientists are concerned about the possible impacts of small plastic fragments—microplastics—in the environment. The role of plastics as a vector for transporting chemicals and species in the ocean is as yet poorly understood, but it is a potential threat to ecosystems and human health. Improved waste management is the key to preventing plastic and other types of litter from entering the ocean. The ocean has become a global repository for much of the waste we generate. Marine debris includes timber, glass, metal and plastic from many different sources. Recently, the accumulation and possible impacts of microplastic particles in the ocean have been recognized as an emerging environmental issue. Some scientists are increasingly concerned about the potential impact of releases of persistent bio-accumulating and toxic compounds (PBTs) from plastic debris. At the same time, the fishing and tourism industries in many parts of the world are affected economically by plastic entering nets, fouling propellers and other equipment, and washing up on beaches. Despite international efforts to stem the flow of plastic debris, it continues to accumulate and impact the marine environment. To reduce the quantity of plastic entering the ocean, existing management instruments need to be made more effective and all aspects of waste treatment and disposal need to be improved. Several common types of plastic are buoyant and have been transported by ocean currents to the remotest regions of the planet, including the Arctic and Antarctic . Media attention has focused on reports of the relatively high incidence of plastic debris in areas of the ocean referred to as ‘convergence zones’ or ‘ocean gyres’. This has given rise to the widespread use of terms like ’plastic soup’, ‘garbage patch’ and ‘ocean landfill’. Such terms are rather misleading in that much of the plastic debris in the ocean consists of fragments that are very small in size while the areas where they are floating are not, for example, distinguishable on satellite images. Nevertheless, publicity resulting from media reports and from the activities of several NGOs has helped to raise public and political awareness of the global scale of the plastic debris problem, together with the larger issue of marine litter. 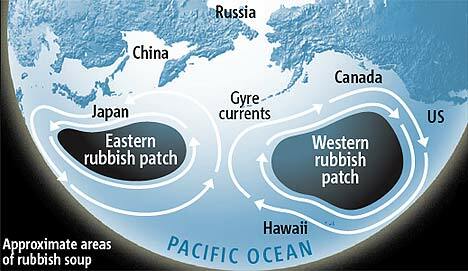 The “garbage patch,” as referred to in the media, is an area of marine debris concentration in the North Pacific Ocean. The name “garbage patch” has led many to believe that this area is a large and continuous patch of easily visible marine debris items such as bottles and other litter—akin to a literal blanket of trash that should be visible with satellite or aerial photographs. This is simply not true. While litter items can be found in this area, along with other debris such as derelict fishing nets, much of the debris mentioned in the media these days refers to small bits of floatable plastic debris. These plastic pieces are quite small and not immediately evident to the naked eye. Where are the “garbage patches”? Eastern Pacific garbage patch - Concentrations of marine debris have been noted in an area midway between Hawai‘i and California within the North Pacific Subtropical High, an area between Hawaii and California. Due to limited marine debris samples collected in the Pacific it is still difficult to predict its exact content, size, and location. However, marine debris has been quantified in higher concentrations in the calm center of this high-pressure zone compared to areas outside this zone. It should be noted that the North Pacific Subtropical High is not a stationary area, but one that moves and changes. This area is defined by the NOAA National Weather Service as "a semi-permanent, subtropical area of high pressure in the North Pacific Ocean. It is strongest in the Northern Hemispheric summer and is displaced towards the equator during the winter when the Aleutian Low becomes more dominant. Comparable systems are the Azores High and the Bermuda High." The High is not a stationary area, but one that rotates, moves, and changes. Western Pacific garbage patch - There is a small "recirculation gyre" south of the Kuroshio current, off the coast of Japan that may concentrate floating marine debris; the so-called western garbage patch. The exact forces that cause this clockwise rotation are still being researched; however it may be caused by winds and ocean eddies (clockwise or counter-clockwise rotating waters). Research is ongoing by academia such as the University of Hawaii and Massachusetts Institute of Technology, to further understand the true nature of and forces behind these recirculation gyres. Are the Pacific “garbage patches” the only areas where marine debris concentrates? 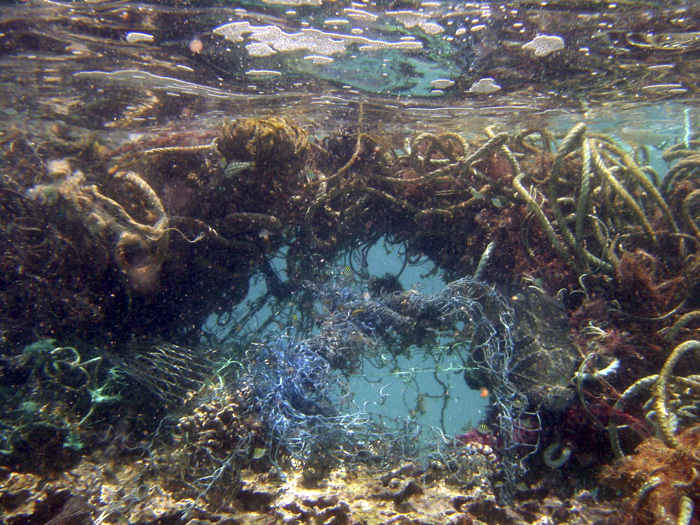 The “patches” are not the only open ocean areas where marine debris is concentrated. Another important area is the North Pacific is the Subtropical Convergence Zone (STCZ). This area, located north of the Hawaiian archipelago, has a high abundance of marine life, is a known area of marine debris concentration, and is one of the mechanisms for accumulation of debris in the Hawaiian Islands (Pichel et al., 2007). Oceanographic features similar to the North Pacific Subtropical High and STCZ exist in other oceans of the world. Little research to date has been conducted on marine debris in these areas. Because of this no one can say for sure how large these areas are, especially since they move and change, sometimes daily, and no accurate estimate exists of how much debris is out there. Can plastic marine debris harm fish? Direct Impacts - Studies have shown that fish and other marine life do eat plastic. Plastics could cause irritation or damage to the digestive system. If plastics are kept in the gut instead of passing through, the fish could feel full (of plastic not food) and this could lead to malnutrition or starvation. The degradation time for plastic in the marine environment is, for the most part, unknown. Estimates are in the region of hundreds of years. Most types of plastic cannot be considered biodegradable in this environment, as the term ‘biodegradable’ would only apply to those that are broken down by bacterial action or oxidation into simpler molecules such as methane, carbon dioxide and water (Narayan 2009). ‘Biodegradable’ or ‘oxy-degradable’ plastics may be broken down in industrial composters, or in landfill, in a controlled environment with a temperature consistently above 58ºC (Song et al. 2009). The temperature in most oceans is far below that, and the degradation process is therefore much slower. Plastic in the ocean tends to fragment into smaller particles of similar composition, a process aided by the action of waves and wind. UV radiation in sunlight plays an important role in breaking down certain plastics (PP, PE). When plastic is manufactured, a UV stabilizing agent is sometimes added to extend the ‘life’ of certain items, also making it harder for them to break down after disposal. Seawater absorbs and scatters UV, so that plastics floating at or near the surface will break down more rapidly than those at depth. When plastic objects sink to the seabed, the breakdown process is slowed significantly since there is virtually no UV penetration and temperatures are much colder. Plastic debris has been observed on the ocean floor from the depths of the Fram Strait in the North Atlantic to deepwater canyons off the Mediterranean coast, and much of the plastic that has entered the North Sea is thought to reside on the seabed (Galgani et al. 1996, Galgani et al. 2000, Galgani and Lecornu 2004). The surface of most plastic objects is subject to fouling in the sea due to the growth of bacteria, algae, barnacles, shellfish and other organisms. 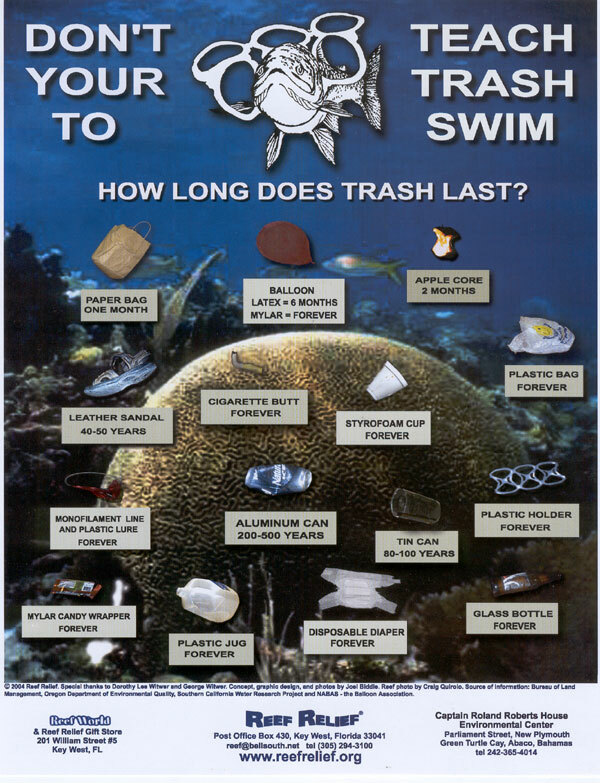 This process spans the entire size spectrum of debris, from microplastics to large single items such as buoys. A biological surface layer may affect breakdown mechanisms. Fouling may also increase the density of plastic objects, causing them to sink, with particles being redistributed throughout the whole water column and some eventually sinking to the ocean floor. Later removal of the biological surface layer by grazing organisms may cause the objects to float upwards.